Well, that’s not what it’s called, actually – the cookbook is a hundred-year old general cookbook, put out by Lowney’s – a turn of the last century chocolate manufacturer. The company does not seem to exist any more, for most of the google-mentions I can find for lowney+chocolate are for faded memorabilia. They seem to have invented the brownie, though – all hail! 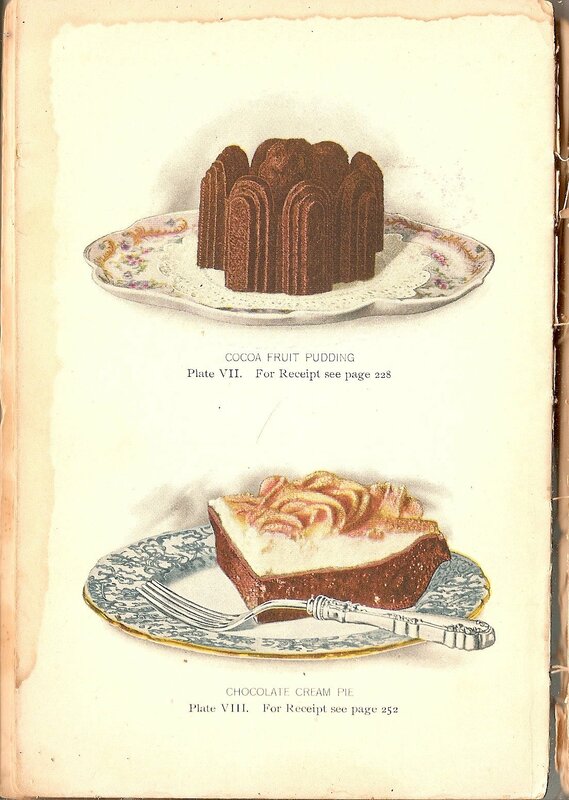 The cookbook they published in 1907, with a revised edition in 1912 might be taken in part as an early version of the sort of corporate publication skewered gloriously by James Lileks in The Gallery of Regrettable Food – mostly because there are a lot of recipes for chocolate in it. Not because of the various color plates inserted – which are actually rather demure and tasteful. Except maybe for the plates involving cuts of beef. No; overall the battered and next-thing-to-falling apart cookbook that my daughter picked up at an estate sale is an interesting cultural relic; it was a useful bridge between eras – between indigestible Victorian and conventional late 20th century. And I promised to post a couple of representative and amusing recipes from it on the Splendid Table pages; representative, amusing, doable in a modern kitchen, and maybe even appealingly edible. Arrange layers of mushrooms and salt in preserving kettle: let stand on back of stove for 12 hours. Press through a sieve and measure. For every quart of mushroom liquor, add 1 pint vinegar, 1 Tbsp salt and 2 Tbsp each of cloves, mace, allspice and mustard seed. Boil until thick, then bottle. Now the good stuff. Chocolate!!!! Chop 2/3 cup beef suet, 1 cup chopped dried figs and 2 ¼ cup soft bread crumbs in a meat chopper. (Probably use a food processor for this.) Add 1 cup brown sugar, 2 eggs, 1/3 cup milk and ½ tsp salt. Steam for three hours. Serve with Hot Chocolate Sauce and cream sweetened and flavored. Presumably this pudding batter is poured into a lightly-buttered steamed pudding mould with a latched cover, and then boiled in a deep saucepan for three hours. Don’t knock this process – it makes a very delicate and cake-like pudding. Ah, at last something more to contemporary American taste! In a double-boiler melt 2 ounces Lowney’s Premium Chocolate (I am guessing here that semi-sweet baking chocolate is a suitable sub, based on the amount of additional sugar called for – YMMV). Add ½ cup sugar, 4 egg yolks, 2 cups milk, ¼ tsp salt and simmer until mixture is thickened. Soak 2 Tbsp powdered unflavored gelatin in ¼ cup cold water, and add to egg-chocolate-milk mixture. Stir until gelatin is dissolved, then strain through a sieve and cool until just beginning to set. Fold in 2 cups whipped cream, pour into mold and set until hardened. Un-mold and garnish with whipped cream and fresh fruit. 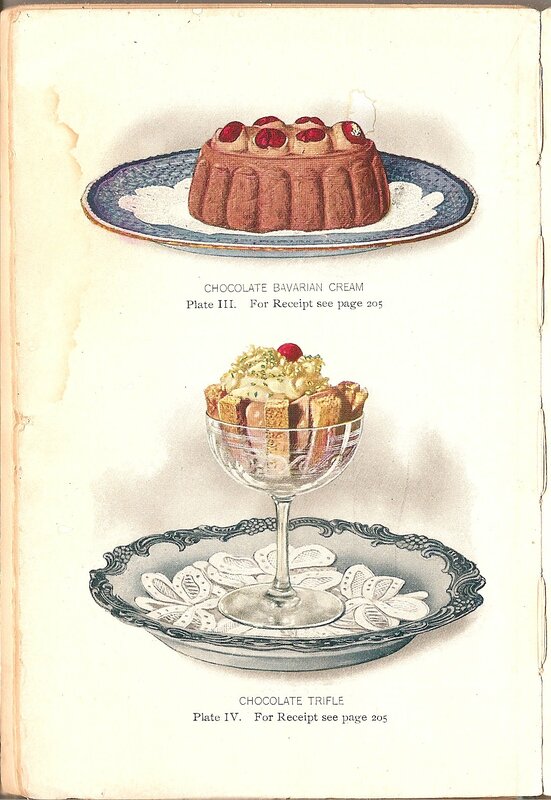 Right then – anyone ready for more 100-year old recipes? 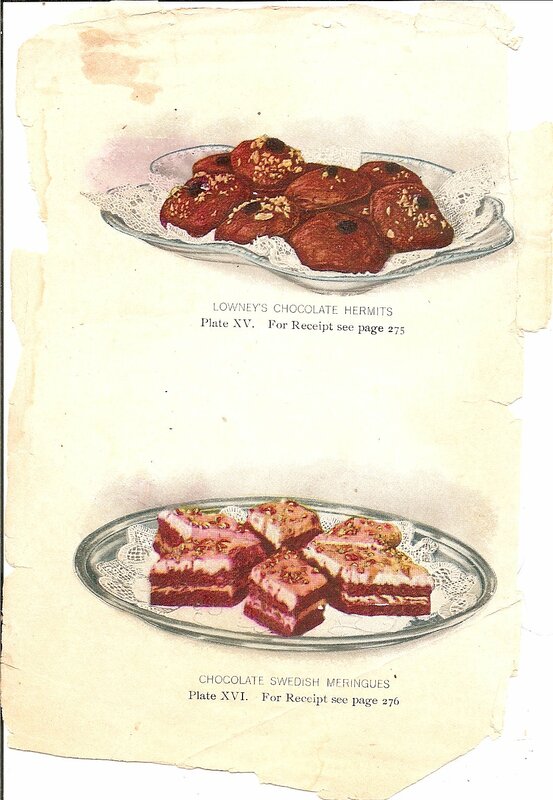 Lowney’s was an American chocolate producer, a rival to Hershey – and is thought to have originated the recipe for brownies. Their cookbook was a best-seller in the early 20th century – and especially heavy on recipes using chocolate. Chop together in a meat chopper (or modern processer) 2/3 cup beef suet, 1 cup chopped figs, and 2 1/4 soft bread crumbs. Add to this mixture, 1 cup cocoa powder, 1 cup brown sugar, 2 eggs, 1/3 cup milk and 1/2 teasp salt. Pour into a greased pudding mold and steam for 3 hours. Unmold and serve with chocolate sauce, or whipped cream sweetened and flavored. Melt in a double-boiler: 2 squares Lowney’s Premium Chocolate or 1/2 Lowney’s Cocoa, and add 2/2 cup sugar, 1/4 cup cornstarch, 3 egg yokes, 2 cups milk and 1/4 teasp salt, cook until thick, stirring gently, then add 1 Tbsp vanilla. Pour into a baked pie shell and cover with a meringue made by beating 2 egg whites until stiff, and assing 2 Tbsp sugar. Brown in oven briefly, and serve cold. I made this dessert (which in the Pennsylvania Dutch country [which isn’t Dutch but actually a corruption of “Deutch” – or German] can be eaten at breakfast) for my English-Greek neighbors, when I was stationed in Greece in the early 1980′s. They were mystified on several levels, as it is not really a pie, although it is baked in a pastry crust, and can be baked until it is sort of a cake, or left with a soggy center like a pudding. It also does not contain flies. They were also baffled about who or what, exactly, were the Amish, although that was explained very neatly by release of the movie “Witness” at about that time. 1 8-inch unbaked pie crust, chilled or pre-made or from scratch. Combine: 1 1/2 cup flour, with 1/2 brown sugar, a pinch of salt, 1/4 teasp ginger, 1/4 teasp nutmeg, and 1/4 cup soft butter. Rub together with your hands until it resembles soft crumbs. Combine in another bowl: 1/2 teasp baking soda, 1/2 cup molassas, 1/2 boiling water. (the mixture will foam up, slightly) Add to it 2/3rds of the crumb mixture and pour into the pie shell. Top with remaining crumb mixture. Bake at 375 degrees for 40 minutes, or less if you like it sort of pudding-soggy in the middle.